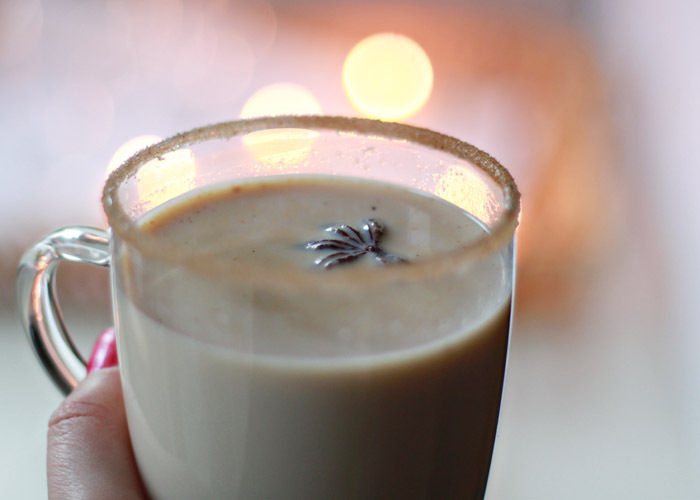 Cinnamon, nutmeg, vanilla, Irish cream, and bourbon make for a cozy hot cocktail that’ll warm up the coldest of winter nights. With winter solstice right around the corner, it’s optimum time for getting cozy. Fuzzy blankets, front-of-TV cuddles, flickering candles, steaming-hot drinks. I mean, when the sun goes down at 4:30 in the evening, what else can you do but cradle a warming winter cocktail and wholeheartedly embrace the season? This is another throw-together recipe that, with a few tweaks, has become a fast winter favorite. We wanted a warm cocktail; I didn’t want to go to the store. So we made do with what we had in our cupboards. And we adored the outcome. 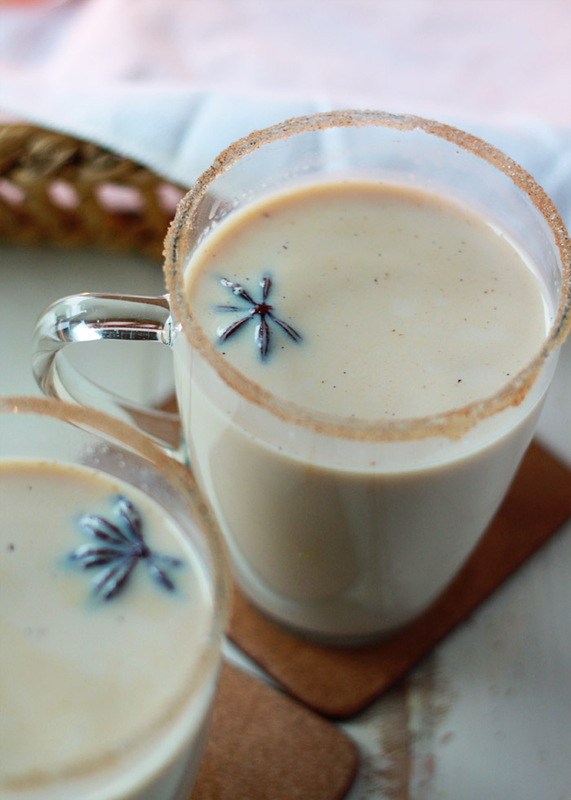 With the star anise, these Warm Spiced Vanilla Cocktails have a bit of a chai latte air, though mostly, they just kind of taste like the season. 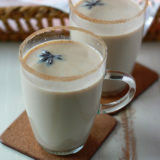 Vanilla – best if you can include the bean but totally fine without – plus a good dose of nutmeg and cinnamon to boot. Irish cream and bourbon for the lushy part of the equation – wonderfully warming and just darn tasty. The rim though. That cinnamon-sugared rim. It’s a keeper. It reminds me of cinnamon toast. Except no bread. Or toaster. Just cinnamon sugary goodness. We may not be seeing the sun right now, but things like this can definitely still brighten our days (and nights). 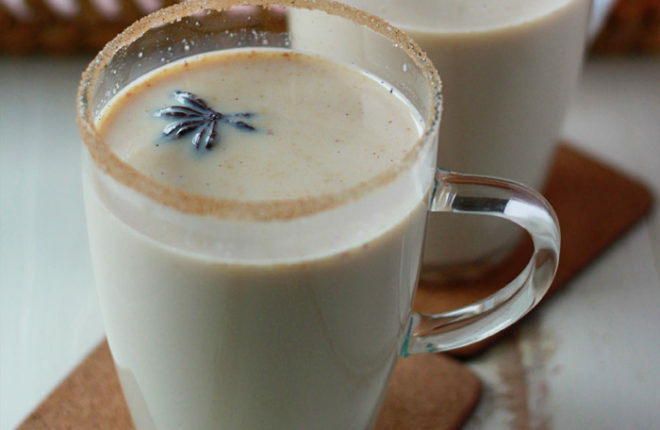 To a medium saucepan over medium-low heat, add the milk, maple syrup, cinnamon stick, nutmeg, and star anise. If using a vanilla bean, split it open and scrape out the seeds. Add the seeds and remainder of vanilla bean to the pan. Cook, stirring occasionally, until the mixture is hot and steaming. Reduce to low and heat for 5 minutes, being careful not to ever let it come to a full boil. Remove from heat. Place a fine-mesh sieve over a large heat-proof bowl and carefully pour the liquid over the sieve. Discard the solids. Add the liquid back to the saucepan. Stir in the Irish cream, bourbon, and vanilla extract. To garnish the mug rims, pour the 1 tablespoon pure maple syrup into a small saucer. In a small bowl, mix together the sugar and cinnamon, then pour it onto another small saucer. Dip the rims of the glasses into the maple syrup, then dip into the cinnamon and sugar mix, pressing to coat evenly. Flip over and fill glasses with the hot cocktail. Serve. We’ve substituted Kahlua for the Irish cream and bourbon – also good! 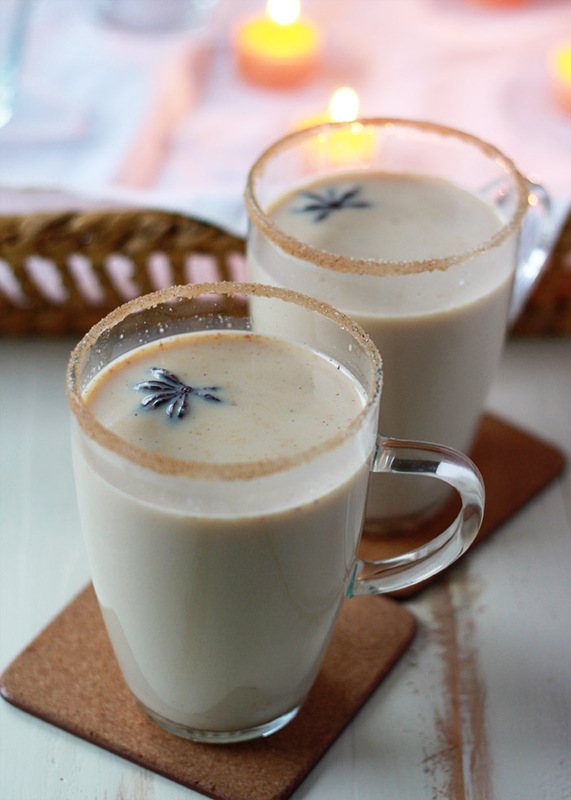 Use Baileys Almande Almondmilk Liqueur and unsweetened almond milk. Can I swap my lukewarm cup of coffee for one of these right now? Maker’s Mark is always in the house because my husband makes his Manhattan’s with it, and that cinnamon spiced rim is genius! I can just imagine making these and sitting out in the cool summer night air to watch the stars. Perfection.